SITEC hosted yet another successful market briefing session on 16 May for online selling enthusiasts and new converts to e-commerce. 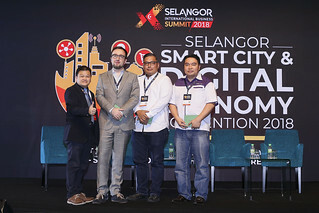 Inviting experts from four major online marketplaces (Lazada, 11street, Youbeli and LogOn) in Malaysia to the Selangor Digital Creative Centre (SDCC), they collectively shared expert practical insights and tips on how online merchants can expand their online businesses through their respective marketplaces. Over 100 attendees, comprising a good mix of those who are already registered with marketplaces and those who were keen on starting their journey in the world of online commerce, were in attendance. Software developer Mun Sai Kit, who plans to collaborate with his friends to form a startup, was here to learn about how marketplaces work: “I now understand fees and charges, as well as the benefits of joining a marketplace. It’s very beneficial!”, he said. Selvarajoo, on the other hand, attended today’s event on behalf of his daughter, who is starting up an e-commerce business importing products from India for the Malaysian market. Khadijah, a twenty-something student from Pakistan, has a strong interest in ecommerce and attended today’s briefing session to improve her knowledge of marketplaces. “The event today was very useful! I learnt how to set up an e-store, and I have a better idea now of which is the best platform to sell my products on, which is Lazada. 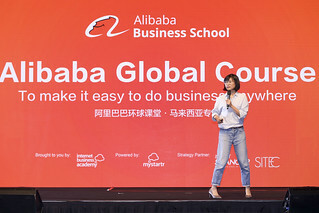 Overall, it was a very nice event, and I learnt so much on how to launch (my product) and how to expand my business further, not just here in Malaysia, but back in my country as well.”, she quipped. Harvin (pictured, right), meanwhile, owns an online business selling healthcare products. At the event, hosts Azwan and Danish from SITEC briefly introduced participants to SITEC, afterwhich the COO of Youbeli, Richard Wong, took to the stage to share more about Malaysia’s pioneer online marketplace, Youbeli. Started in 2006, Youbeli offers multiple product categories, with over 200,000 SKUs by over 1,000 merchants. Youbeli sees over 90,000 site visits monthly, with a very strong customer return base of over 65,000 customers, and is unique in that it is the only online marketplace that has support for all three major languages in Malaysia (BM, Mandarin, and English). It is also known for its easy, one-stop telco prepaid and gaming reloads, as well as a reasonable flat rate commission structure. Youbeli also boasts several features for merchants at no extra fee, such as a personalised store fronts, support for web (desktop/PC), mobile and tablet formats; a comprehensive back-end system for merchants, periodical merchant training sessions, and free use of the photo studio facilities in their office in i-City, Shah Alam. To learn more about Youbeli for merchants, visit their website here. After Wong’s presentation, Ken Lai took to the stage to share more about LogON+, an online marketplace whose popularity is harnessed by the collective promotion and marketing done on media assets belonging to both the Sin Chew Media Corporation and the Nanyang Group. Backed by 90 years of history and excellent standing and prestige in the local Chinese-speaking communities in Malaysia, LogOn marketplace native advertises in their media assets to over 2.5 million Chinese language readers locally, capturing 93% of the Chinese reader market. The LogOn+ marketplace boasts an A-Z e-commerce system for merchants, allowing them to only consign stock for sales, removing the usual hassles related to logistics and product management common in marketplaces. In this new iteration of the marketplace, new features such as the COD (Cash on Delivery) and Call to Buy system are available for merchants as well. To learn more about LogOn for merchants, visit their website now. Shaun Yap, Seller Management Manager from 11street took to the stage to share more about opportunities with 11street after a short break. 11street is a Korean-based open marketplace with presence across most continents. Started in Korea in 2008, it first expanded to Turkey in 2013 (as n11.com), Indonesia in 2014 (elevenia.co.id), and then Malaysia in 2015 (11street.com.my). They just recently launched their newest venture in Thailand in February this year at 11street.co.th. 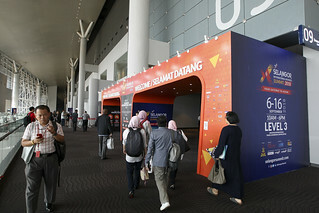 In Malaysia, 11street is managed by Celcom Planet Sdn Bhd, a joint venture between Celcom Axiata (a local telco provider) and SK Planet (owners of 11street Korea). 11street reaches out to customers via Celcom’s 13 million subscribers through SMS Blast & Blue Cube Campaigns, on top of frequent promotions and campaigns offering coupons and discounts to attract and retain consumers. 11street supports merchants with various initiatives such as the 11st Seller Zone, an education centre and support facility to provide training and development programmes, as well as facilities such as photo studios. To learn more about 11street for merchants, visit their website here. Yamunah Tangarajah, Head of Seller Inflow & Engagement at Lazada, shared some facts about the e-Commerce market in Malaysia, before briefly introducing the online platform to the audience. Lazada is the leading one-stop online marketplace in Malaysia, with main investors Temasek (Singapore) and Alibaba Group (China) backing their business. With a 77% customer satisfaction rate and nation-wide presence, Lazada Malaysia achieves record-breaking traffic during campaigns through the use of massive offline/online marketing activities. The platform has seen an exponential increase in seller growth, with 46% of individual sellers with the platform based outside the Klang Valley. Lazada is also a key contributor to the DFTZ Working Committee. Lazada offers in-house operational expertise to its sellers, providing operations and commercial support, delivery, marketing, tools, and training services. To find out more, visit their website here.